Bosons are force carrying particles that mediate the interactions between fermions (quarks and leptons). Thus they are responsible for three of the four fundamental forces of the Universe. They all have spin values that are whole numbers. (Regarding "spin", it is explained in detail on the page about leptons here). They are not bound by Pauli's Exclusion Principle, meaning they can co-exist in the same quantum state. This, apparently, allows them to behave the way they do. I'm talking about elementary particles here, because these are the important ones, without which the Universe couldn't function. There are examples of composite ones too, which we'll consider later. There are currently four of these particles definitely known to exist: the photon, the gluon and the W and Z bosons. I say "definitely" because a fifth one - the famous Higgs boson - might have been discovered at the Large Hadron Collider at CERN in Switzerland. A sixth example, that of the graviton, is the next big one to discover - and some physicists still question its existence. This will be looked at in detail on the "theoretical particles" page. The photon mediates the electromagnetic force, which includes light, radio waves, X-rays, gamma rays and any other ray you can think of. It was Albert Einstein who first suggested that light was actually quantized. In other words, it consisted of small quanta, or packets, of energy that was a "gauge boson". Light actually behaves both like a particle and a wave, an attribute known in physics as "duality". This particle has zero mass, meaning it has to move at the speed of light (which is handy, as it is light). It also has zero electrical charge. These gauge bosons are responsible for the strong nuclear force that binds quarks together, allowing hadrons and, ultimately, atoms to form. They, like the photon, have zero mass and no electric charge. If you've read this site's page on quarks, you'll know that a baryon is made up of three of them. Also, if you've read the bit on Pauli's Exclusion Principle, found in the page about leptons, you'll also know that no more than two quarks can occupy the same quantum state - and three quarks together would seem to be violating that rule. The "colour force" was therefore postulated, which described three different quantum states. It has nothing to do with actual colour, but is named after the three primary hues of red, green and blue. These three can have "anti-" values, too. The theory goes that gluons generate a colour change in quarks by carrying a dual colour/anti-colour charge between them. Thus, they actually participate in the quark interaction. These are particles that mediate the weak nuclear force and govern its interaction. Unlike the previous two, they have mass and, as particles go, this is quite large. The W can have an electric charge of either +1 or -1, while the Z is neutral. Their existence was suspected for some years, but there wasn't a particle accelerator on the planet powerful enough to create them. It wasn't until 1983 that this feat was accomplished by the "Super Proton Synchrotron" at CERN (a predecessor of the Large Hadron Collider). The W types, due to their electric charge, can, by passing from one quark to another, change the type of quark by changing its electric charge either up or down by one unit and altering its spin by one unit, too. The Z, on the other hand, being electrically neutral, can only alter other quantum attributes, such as momentum, spin and energy. Over the decades, various important discoveries have come to light within physics. Firstly, when the electron was discovered, it was found to have mass. The amount of mass was important, too, because if it were too little, then atoms wouldn't be able to form (the reason being too complicated to bother us here), thus negating the possible formation of matter and, thus, the Universe as we know it. Next came the discovery that light was actually made of particles called photons, mentioned above and these had no mass. Subsequently, other elementary particles were discovered - quarks, which had mass and neutrinos, which although thought to be massless at first, were eventually proved to possess a tiny bit. So, the upshot of this was the profound question, why do particles like the electron possess mass, while those such as photons do not? What is responsible for creating the mass? 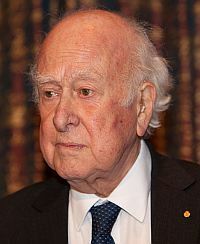 It was Peter Higgs who postulated, in 1964, the existence of a "mechanism" that interacted with certain elementary particles, giving them mass. This idea was also put forward the same year, independantly, by two other groups of physicists. This mechanism, Higgs said, was due to an energy "field" that permeated the whole of the Universe uniformly. "Ripples" in this field manifest as the Higgs boson, but it's the "field" that's more important. We need to first consider what mass actually is. Well, there are two different types of mass: inertial and gravitational. It's the inertial one we're concerned with here. Quite simply, the inertial mass of an object is its tendency to resist a force trying to move it. The effort required to lift a piece of wood is less than picking up an iron girder of the same size. The girder, therefore is more massive. The inertial mass is known as "rest mass". For complex mathematical reasons, particles that travel at light speed must have zero rest mass. Conversely, those travelling at non-light speeds must have non-zero rest mass. This fact is very important in understanding the next section. The Higgs field imparts non-zero rest mass to certain particles. The mechanism behind this is a bit involved. Here's an extremely simplified explanation. We have to assume that all particles initially move at light speed. As the Higgs field is an energy field that permeates the Universe, these particles are bound to interact with it, which has the effect of slowing them down. Think of it as wading through water - it slows you down and you are interacting with it. These particles are, therefore, no longer travelling at light speed...meaning they can no longer have zero rest mass, i.e. they now possess mass. Some particles have a harder time fighting their way through the Higgs field, are slowed down more and are therefore more massive. This accounts for the different masses of particles. Photons and gluons alone, for some reason, do not react with the Higgs field.